Adrian Lam has assessed the chances of Dom Manfredi facing Sydney Roosters in the World Club Challenge next week. And he admits the prospects aren’t looking great as the winger recovers from keyhole surgery to remove floating bone fragments from a knee. 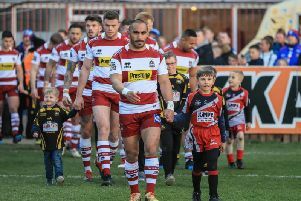 Lam said the recovery window was between two and five weeks – meaning Wigan would need the best-case scenario for him to be passed fit for the February 17 showdown against the NRL champions. “Hopefully he’ll be back for the World Club but it doesn’t look like that happening at the moment,” said Lam. Manfredi spent more than two years on the sidelines with successive knee injuries before blasting back into Super League at the end of last season, and was the club’s two-try hero in their Grand Final victory. “He’s in rehab now and says it feels like a lot different than before the clean-out,” continued Lam. In his absence, Liam Marshall will continue in his wing spot and will be in the side which welcomes Leeds on Friday night – Wigan’s first home game of the season. Lam will name his 19-man squad today but has revealed it is likely to include academy graduate Liam Byrne. The 19-year-old forward is unlikely to figure against Leeds – Lam plans to name an unchanged line-up – but he has impressed his coach. “At this stage I just want to give him a feel for it on game-day, he’ll warm up and be a bit closer to the action,” said Lam.